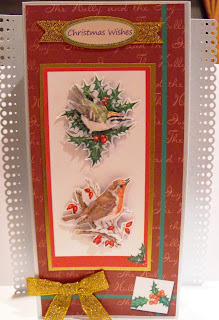 I promised myself I would try and make Christmas cards throughout the year this year, there several christmas card challenges in blogland, so entering the challenges helps to keep me going. I'm also going to try and keep them a little simpler this year, I sort of carried away into some quite heavy and large cards last year, as I send most of my cards abroad this turns out to be quite costly. This one folds into a DL size, is on a Centura Pearl card, images and papers are from a Joanna Sheen CD, edges are punched with a dotty Martha Stewart punch. I like this one Wendy, I see you have had the same thought as me re the size of cards this year. Hi Wendy - lovely to see you back at Bah! Humbug! again. Hopefully we can help you achieve your goal making Christmas cards throughout the year and you've got off to a great start with this beauty. Really like the punched edges and the cute images. Thank you for sharing with us at Bah! Humbug! and good luck in the prize draw. Very pretty card! I like the size, very non-traditional. Well done! This is just gorgeous - beautiful images presented perfectly - a real winner. Thank you so much for sharing your work with us at Bah! Humbug! and good luck in the draw. Very nice Wendy, this is so traditional, thanks for joining us at DCD Christmas Club. What a lovely christmas card. Thanks for joining us at Aud Sentiments. It's Gorgeous. LOve your colours. 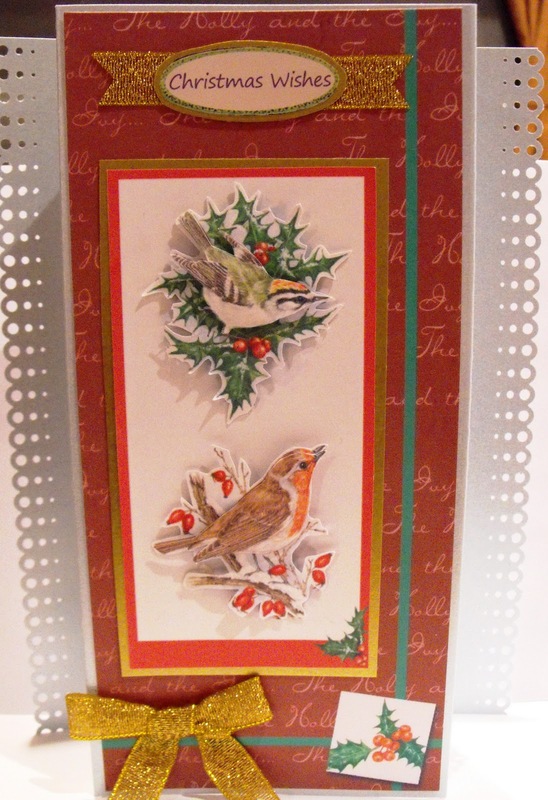 Thank you sooo much for joining us at Die cut Dreams Christmas Club. Lovely card! I do love Holly! This is such a beautiful card! Thanks for joining in the Winter Wonderland Challenge this week. What a great card! I just love it! Thanks for joining us this week at Aud Sentiments Challenge blog for our latest challenge! Hope to see you again for our next challenge!